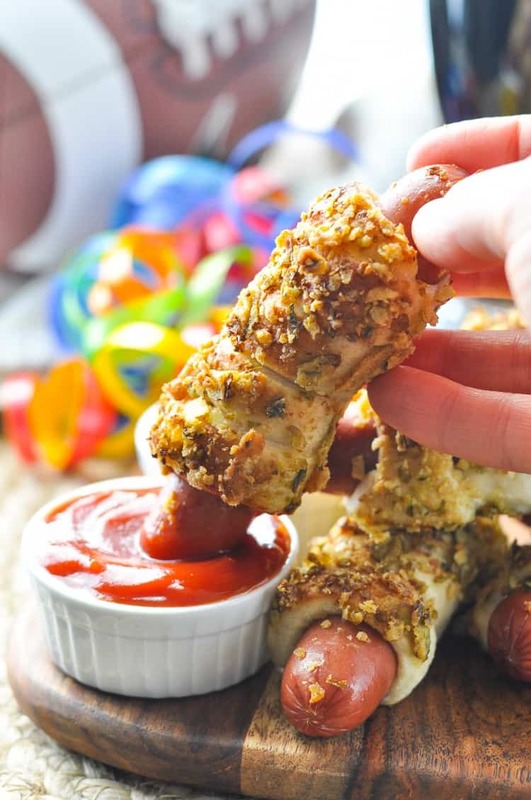 These Jalapeno Pretzel Dogs are fun, easy and so delicious. Perfect for game day! Are you looking forward to celebrating the Big Game? Whether or not you’re a football fan, you can probably get on board with the festive atmosphere and the delicious party food! 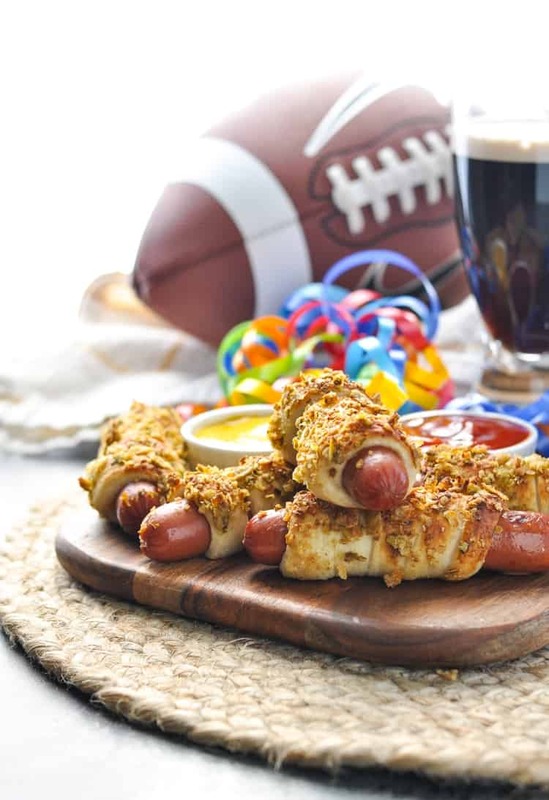 These Jalapeño Pretzel Dogs are easy, crowd-pleasing snacks that come together with just a few simple ingredients — making them perfect for your game day gathering. This is a sponsored conversation written by me on behalf of McCormick & Company. The opinions and text are mine. As many of you know, football is BIG business around here. Keith is a former college football player, and I’m raising three equally enthusiastic little fans. When playoff season and the Big Game roll around, we’re definitely ready to celebrate! Sometimes our parties include friends, and other years we just throw a few blankets on the floor of the living room and enjoy the sport with our immediate family. We don’t need a crowd in order to celebrate — especially when there’s plenty of good food involved! My boys love nothing more than snacking in front of the TV, so I’m always on the lookout for easy, quick-prep options that everyone can enjoy. 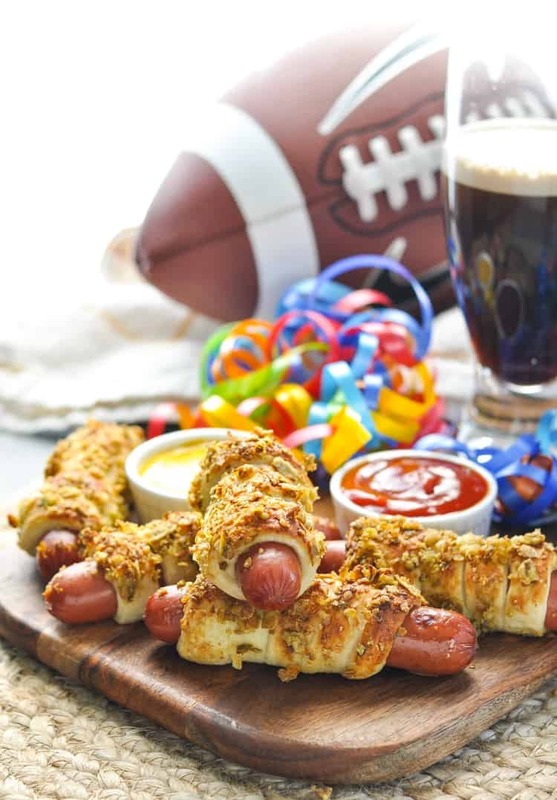 When I saw these Jalapeño Pretzel Dogs, I knew that they would be the perfect solution for any game day gathering. Best of all, you only need a few basic ingredients — and you can find them all at Kroger! 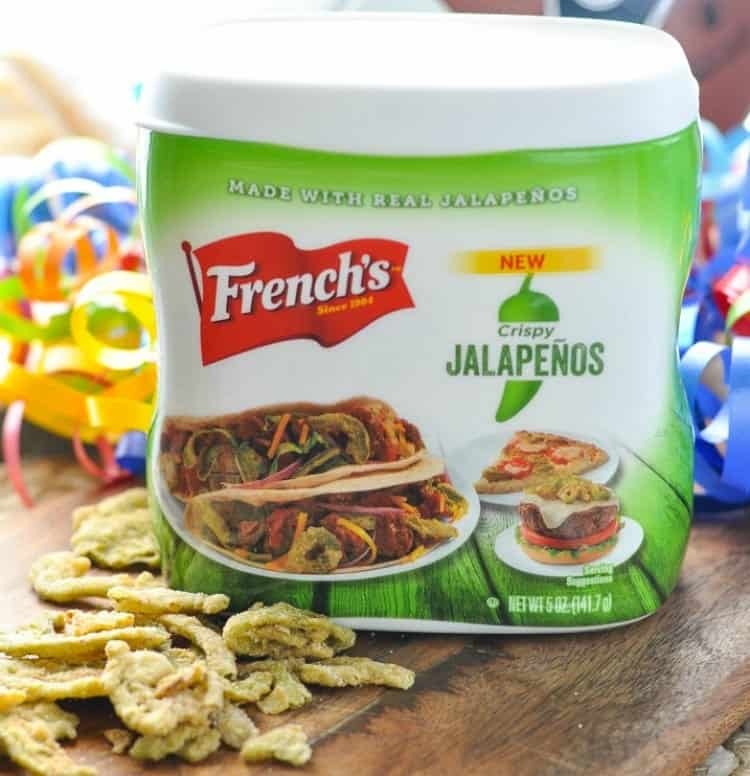 Can we discuss these French’s®️ Crispy Jalapeños for a second? 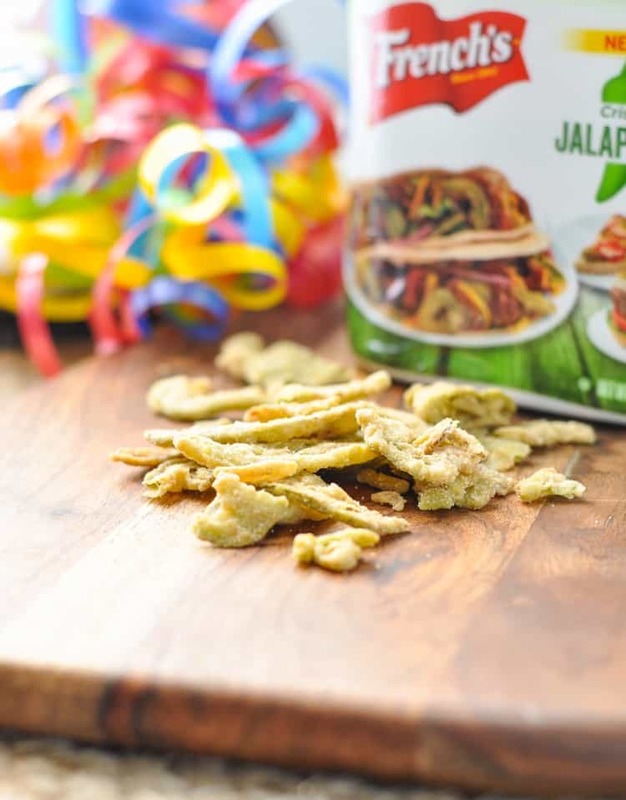 They are perfectly spicy, crunchy and made with real jalapeños. The jalapeños are so good on top of salads, nachos, chili, and even casseroles, adding a kick to all of your favorite meals! 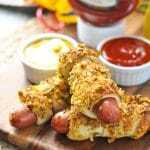 They are also a perfect crispy topping for these pretzel dogs! 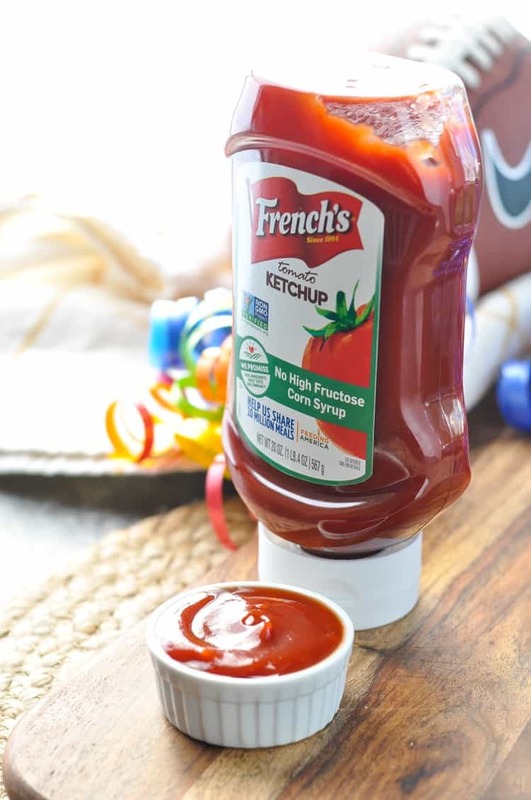 We love French’s Ketchup because it’s non-GMO, it has no artificial colors, flavors or preservatives, and it doesn’t contain any high-fructose corn syrup or gluten. 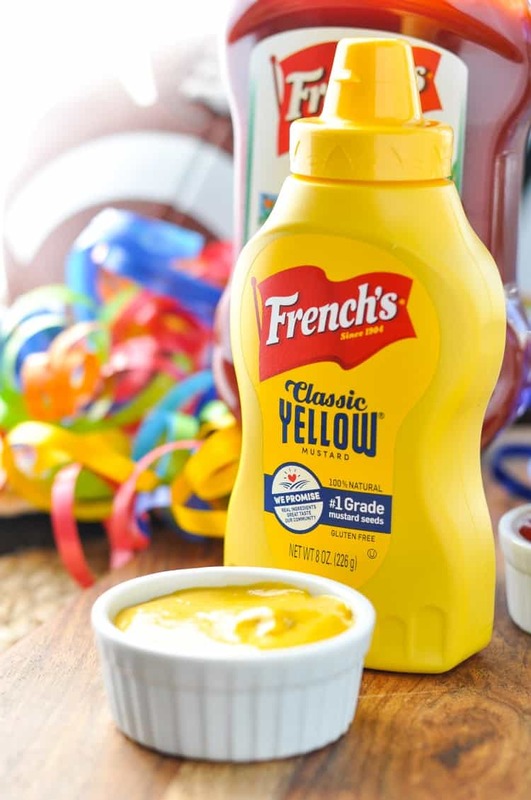 The French’s Classic Yellow Mustard is “America’s Best Loved Mustard” because it’s made with #1 grade mustard seeds and includes no artificial colors, flavors or preservatives. 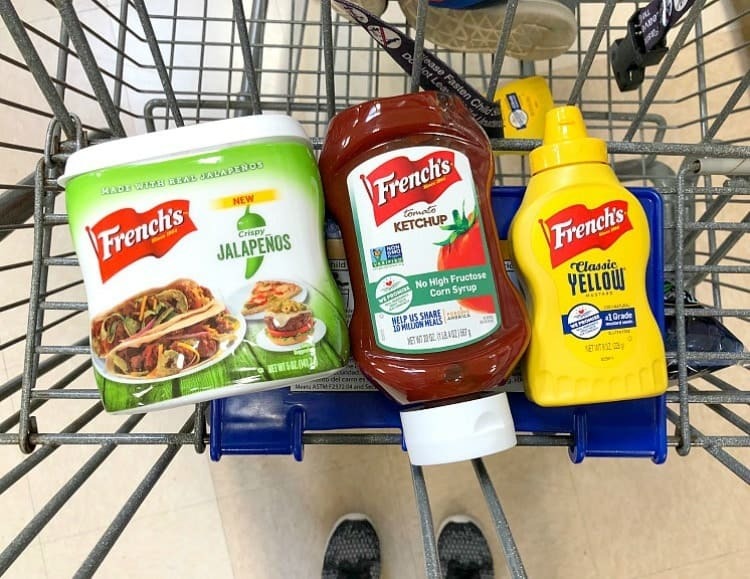 It’s a condiment that we can feel good about feeding our family. 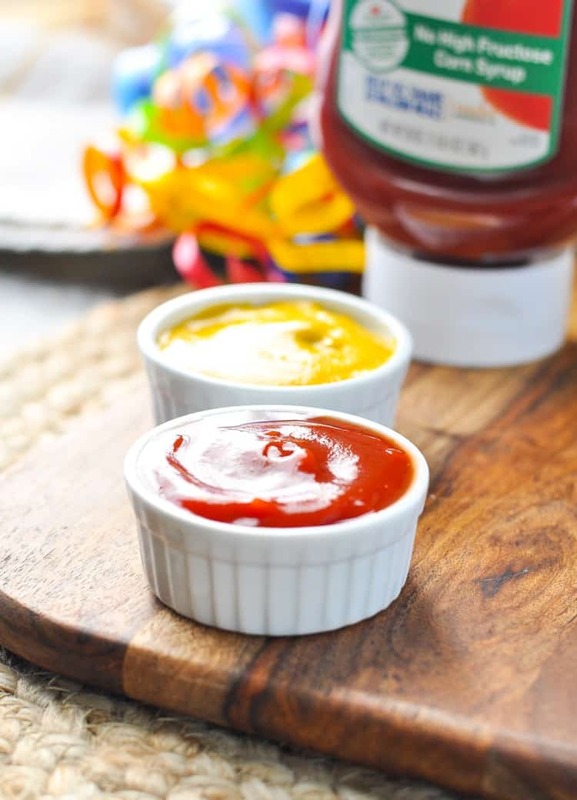 I used ketchup and mustard but when it comes to dips the list is endless…knock yourself out! 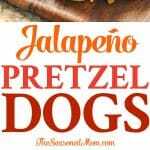 If you’ve tried these Jalapeno Pretzel Dogs or any other recipe on The Seasoned Mom then don’t forget to rate the recipe and leave me a comment below! You can also follow me on Facebook, Twitter, Instagram and Pinterest to see what I’m getting up to. PREHEAT oven to 400°F (200°C). Spray a baking sheet with nonstick spray. BRING a large pot of water to a boil. Add hot dogs and boil for 3 minutes. Once hot dogs are cooked, allow to cool enough to handle. WHILE cooking hot dogs, roll out pizza dough and cut into 12 - 1/2 inch strips lengthwise. (There may be dough leftover; twist into bread sticks and bake) Spread crushed jalapeños in pie dish. LADLE one cup of the boiling water from the hot dogs into a bowl big enough to fit hot dogs. Add baking soda and stir until dissolved. WRAP each hot dog with one strip of dough, twisting it around and back. Leave a 1/2 inch space at each end. When hot dogs are wrapped, carefully dip each into water mixture being sure to cover. GENTLY roll each hot dog in crushed jalapeños and place on baking sheet. Bake for 10 minutes. Bake until browned on top. Serve with ketchup and mustard for dipping. Just when I thought pretzel dogs couldn’t get any more delicious. These look SO stinking good- drooling already! Looks like what I will make for the Super Bowl Party! Thanks! WOW! These sound great! I am definitely looking for the jalapenos! Do you really need to boil the hot dogs though? won’t the bake time cook them enough? Holy yum! These look INCREDIBLE! What an awesome idea! Why the baking soda wash on the hot dogs? Hi, Pamela! It causes a chemical reaction that results in darker pretzels on the outside with a shorter cooking time (which keeps the dough inside soft). 🙂 Baking science! Omg Blair you’re literally ruining my diet over here haha. I’ve never had a pretzel dog before but all I know is I need one in my face now!